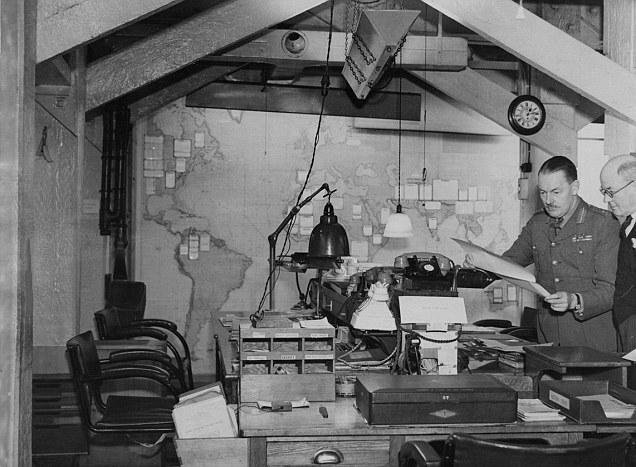 It was a dastardly plan which, if successful, could have meant sweet victory for the enemy. 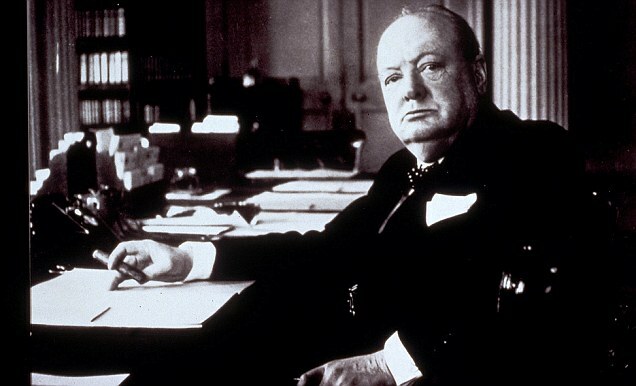 Secret wartime papers exchanged between MI5 officials reveal that the Nazis’ plans to conquer Britain included a deadly assault on Sir Winston Churchill with exploding chocolate. Adolf Hitler’s bomb-makers coated explosive devices with a thin layer of rich dark chocolate, then packaged it in expensive-looking black and gold paper. The lethal slabs of confection were packed with enough explosives to kill anyone within several meters. 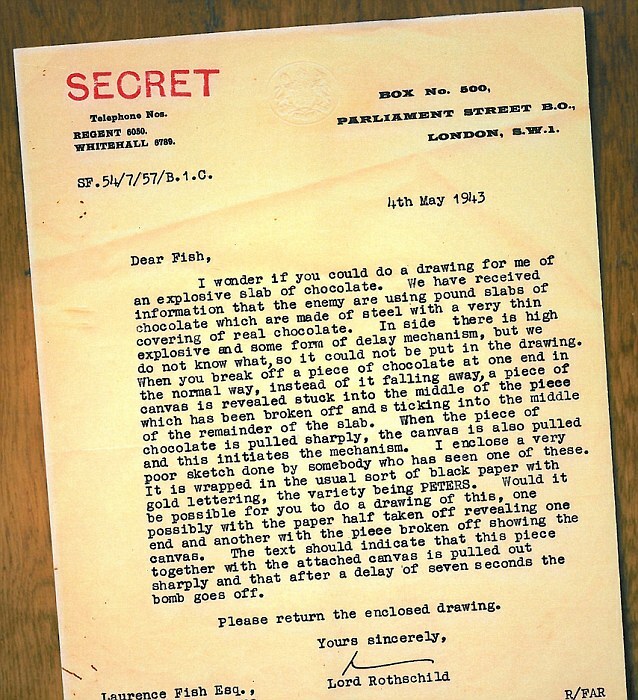 Lord Rothschild, a scientist in peace time as well as a key member of the Rothschild banking family, immediately typed a letter to a talented illustrator seconded to his unit asking him to draw poster-size images of the chocolate to warn the public to be on the look-out for the bars. I wonder if you could do a drawing for me of an explosive slab of chocolate. 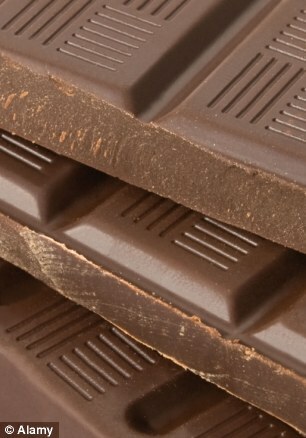 ‘We have received information that the enemy are using pound slabs of chocolate which are made of steel with a very thin covering of real chocolate. ‘Inside there is high explosive and some form of delay mechanism… When you break off a piece of chocolate at one end in the normal way, instead of it falling away, a piece of canvas is revealed stuck into the middle of the piece which has been broken off and a ticking into the middle of the remainder of the slab. ‘When the piece of chocolate is pulled sharply, the canvas is also pulled and this initiates the mechanism. ‘I enclose a very poor sketch done by somebody who has seen one of these. ‘It is wrapped in the usual sort of black paper with gold lettering, the variety being PETERS. ‘Would it be possible for you to do a drawing of this, one possibly with the paper half taken off revealing one end and another with the piece broken off showing the canvas. The letter was found by Mr Fish’s wife, journalist Jean Bray, as she sorted through his possessions following the artist’s death, aged 89, in 2009. She has spent the past two years putting together a book of her late husband’s work – Pick Up A Pencil. The Work Of Laurence Fish. After the war, Mr Fish spent several decades as a commercial artist, producing many iconic posters for corporate giants including Dunlop and BP, rail companies, tourist boards and Save the Children. In his later years, he returned to fine art, producing a breathtaking range of work. 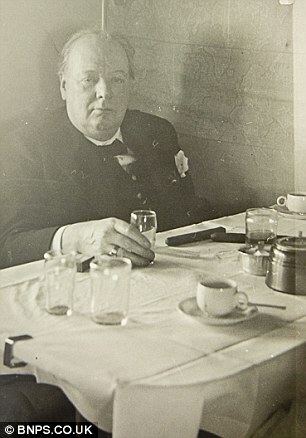 His widow said he had ‘very fond memories’ of his secondment to MI5 and of working with Lord Rothschild in particular. ‘They got on tremendously well and who knows, they might even have saved a few lives,’ said Mrs Bray yesterday from her home in the Cotswolds.